I also have interest in sharing about Excel, PowerPoint and Publisher if there is enough interest. 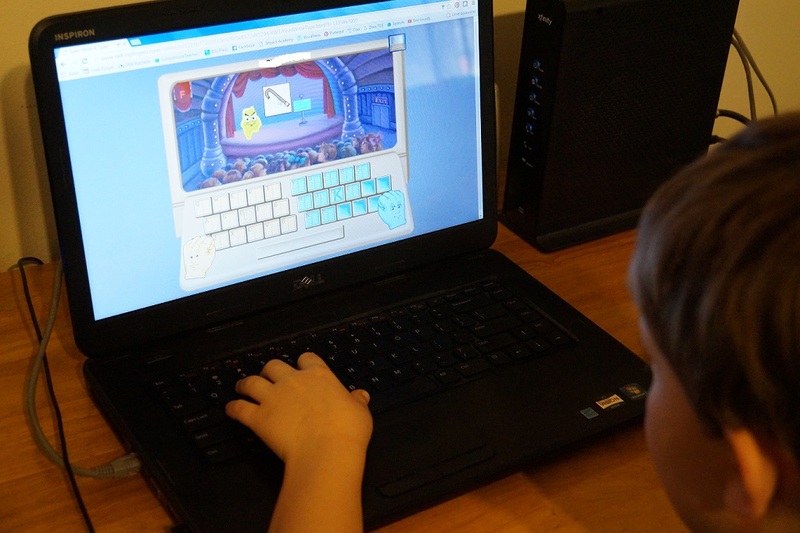 We had the opportunity to review Read, Write & Type from Talking Fingers Inc. and let me tell you – P, our son that used this program, VERY RARELY *REALLY* enjoys any kind of schoolwork regardless of if it is a game on the computer or something he has to manually write. But this, THIS, he LOVED. He actually did not want to stop working through it and he even asked if he could use it. 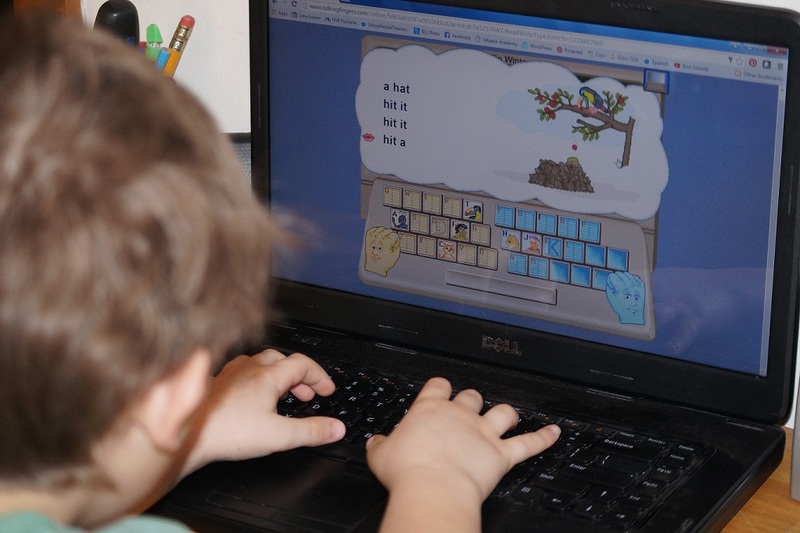 This multi-sensory and motor approach stimulates learning and helps children who have different learning styles. THESE ARE HUGE for us! So, let me explain the program a little. 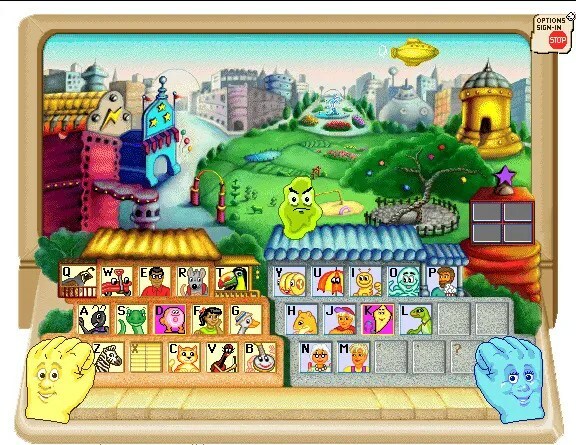 Talking Fingers has three different programs for three different grades: Talking Shapes (iPad app for PreK – K), Read, Write & Type (for K-2; which we are reviewing here) and Wordy Qwerty (Grades 2 – 4). 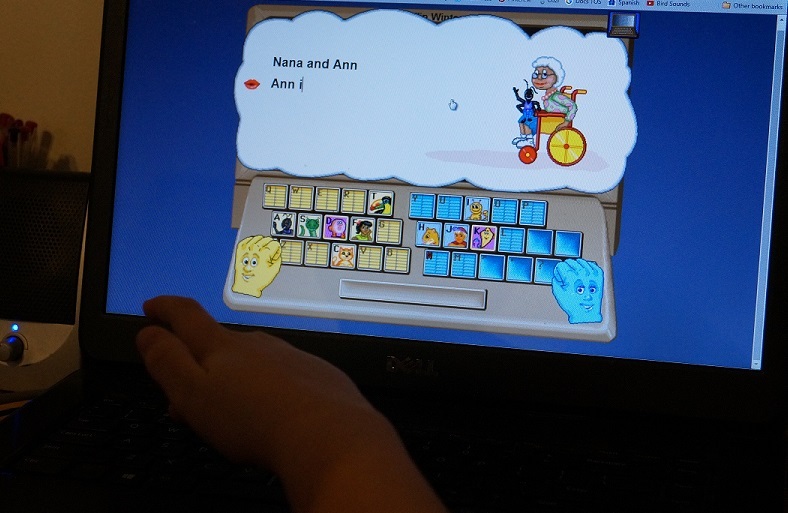 Dr. Jeannine Herron and her colleagues didn’t set out to make Talking Fingers Inc. but found out that there wasn’t a good program available that would teach children a phonic sound associated with a keystroke. 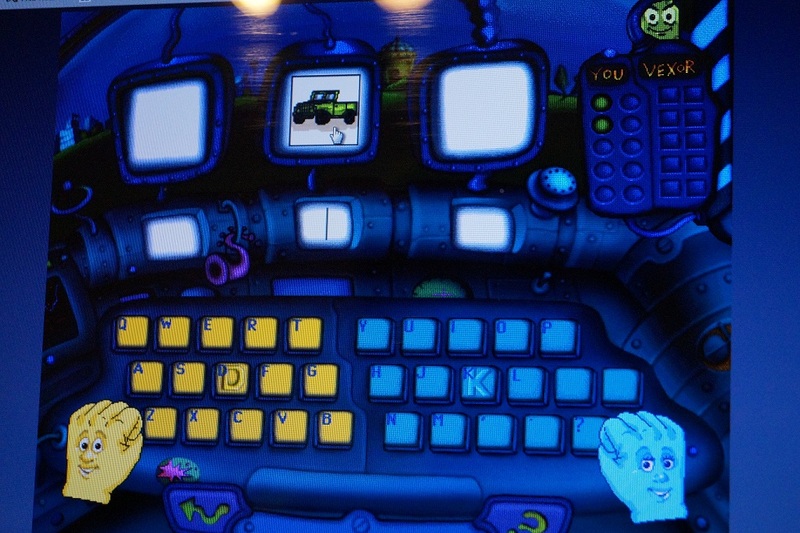 And they wanted children to learn the fun that technology can bring to learning. They really have some amazing thoughts about how this program helps children learn. You should read it all HERE. Once you login and go through the beginning “story” (which you can quickly pass through by hitting the space key) you are taken to this screen. This is the “Home Screen” where they go to each of the different areas of action. One of the first places they go is the auditorium where they confirm if the word starts with the proper letter or not. I really love how EVERY.THING is covered in this program! For instance, if they aren’t sure what the picture is, they simply click on it and the program tells them what the word is. There are very short stories that they listen to and answer questions about that also show the story in action on the right – just another way they “cover all the bases” in this program. My son really loved these stories! 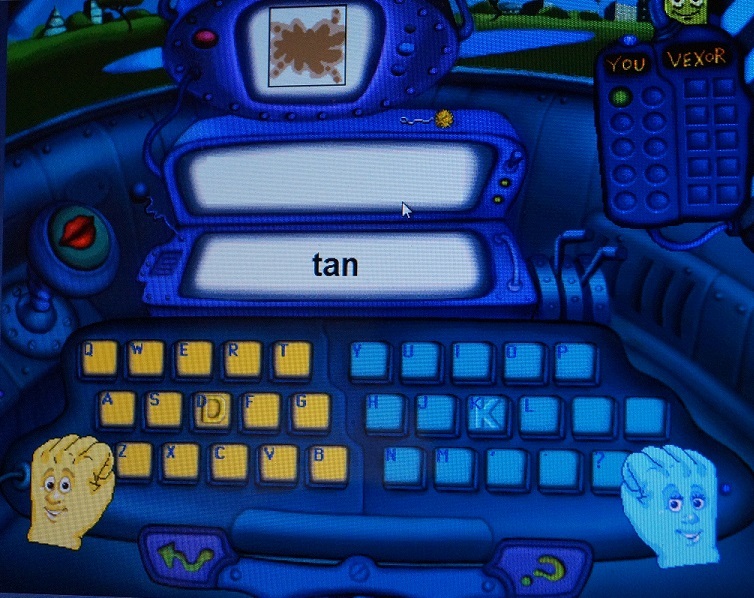 There is “the playground” area where they type what they’ve learned over and over also using the space bar. As they type, the “letter character” (each letter has its own character) moves across the playground. Once it reaches Vexor (the “bad guy” who stole all the letters) they have completed that area. In the below screen shot, they type the actual word of the picture. 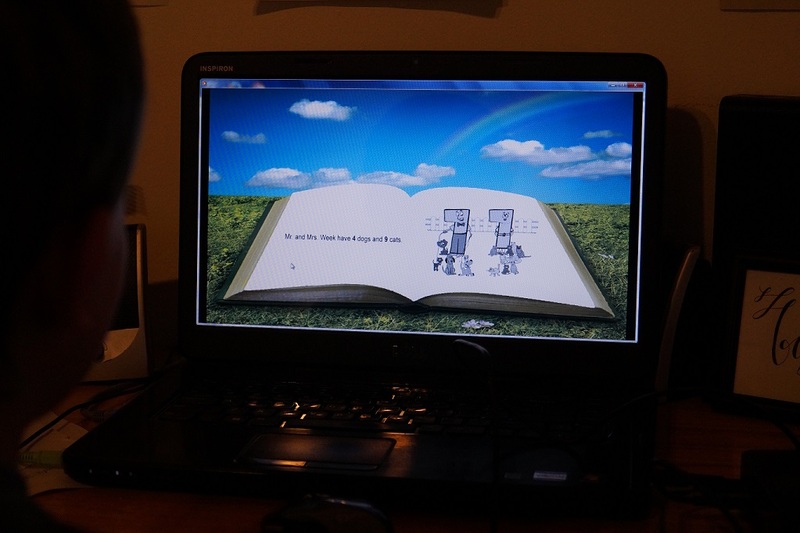 As they progress through the program – they begin to WRITE the story they see and are told. Nice progression! They even have an area that covers writing and sending emails! P REALLY enjoyed this! Here is one of the emails he wrote. 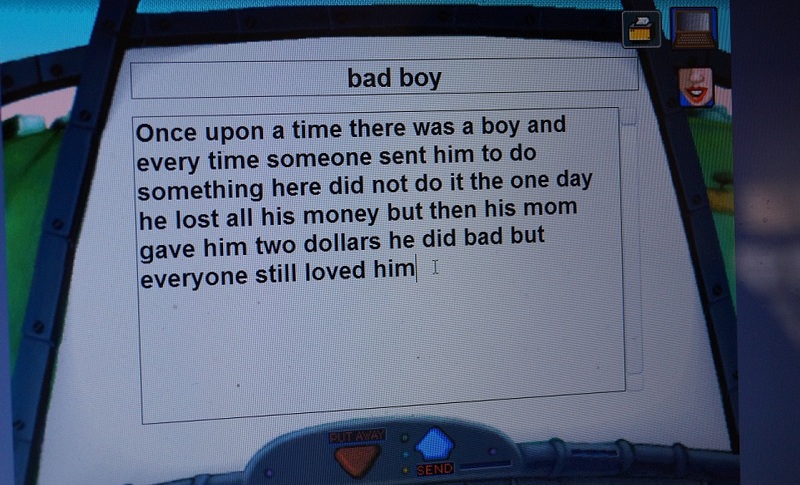 They learn to put a title / subject, “bad boy” and then write the email and send it. Another screen shot showing the progression of the program … now working on four letter words with a space between. 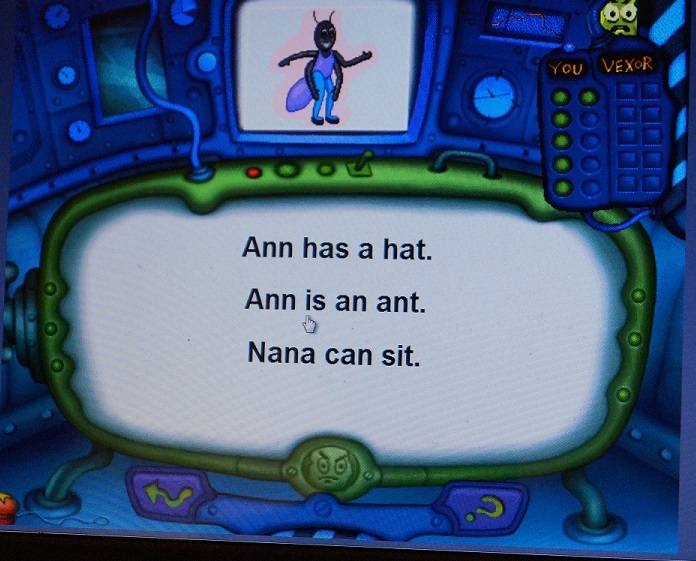 Another thing they do within the program: read the sentence and select the correct picture and look at the picture and select the correct sentence. As they complete each area, they get to print off certificates. My son really loved having certificates to print off and show off! Many times I was able to walk away and work on other things (normally the dishes) while he was working on this program. That doesn’t seem to happen very often either and I really appreciated this about the program. Not only does he GREATLY enjoy it but he can do it without my help! Honestly, I am very rarely impressed with online programs but this one – THIS ONE – was impressive! Not only does my son LOVE working through it but it is a program that seems to have covered ALL the bases necessary. This is a program I HIGHLY SUGGEST! And now that I’ve looked at the cost – WOW! – affordable! Now I **REALLY** suggest it! *grin* $35 for one online user (and the price has a discount for each additional user). 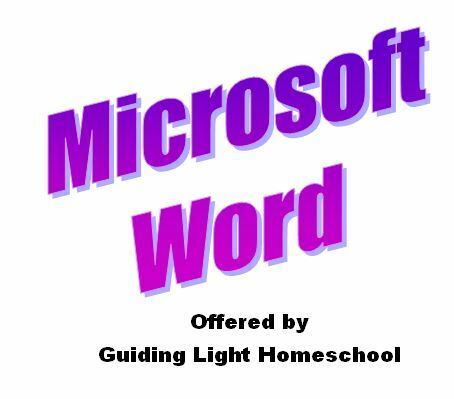 As a side note: Read, Write & Type is fine for kids in Australia, Canada and the UK, too, but the pronunciations of phonemes are different in those countries than they are in the U.S.
We had the opportunity to review the Lifetime Membership from Homeschool Copywork. 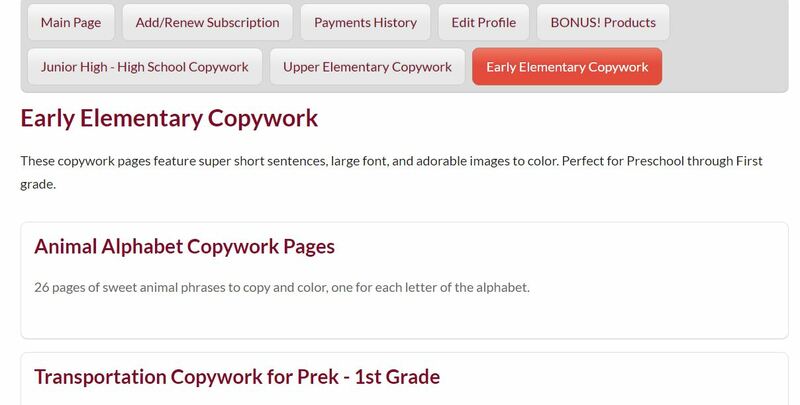 This is a lifetime membership (as it says) and is good for Kindergarten through High School … keep in mind that copywork is not just copying text it is about punctuation, spelling, vocabulary, reading skill and much more which is why it is applicable for high school too! When you login this is the page you see that gives you easy “buttons” to push for each area of copy work you want to see. 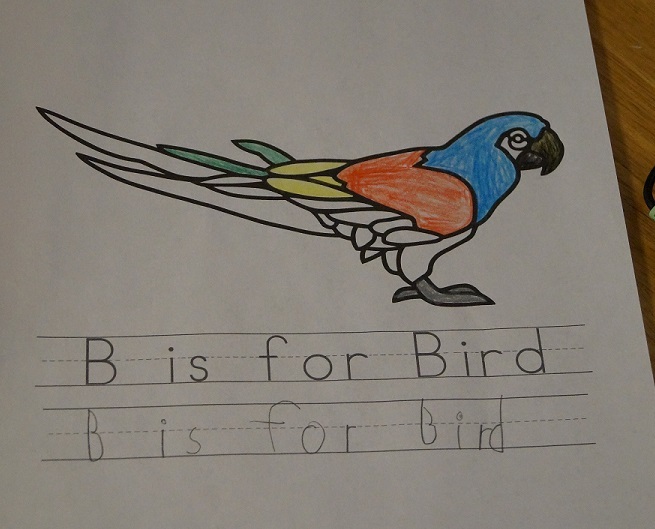 Here we are at Early Elementary Copywork. 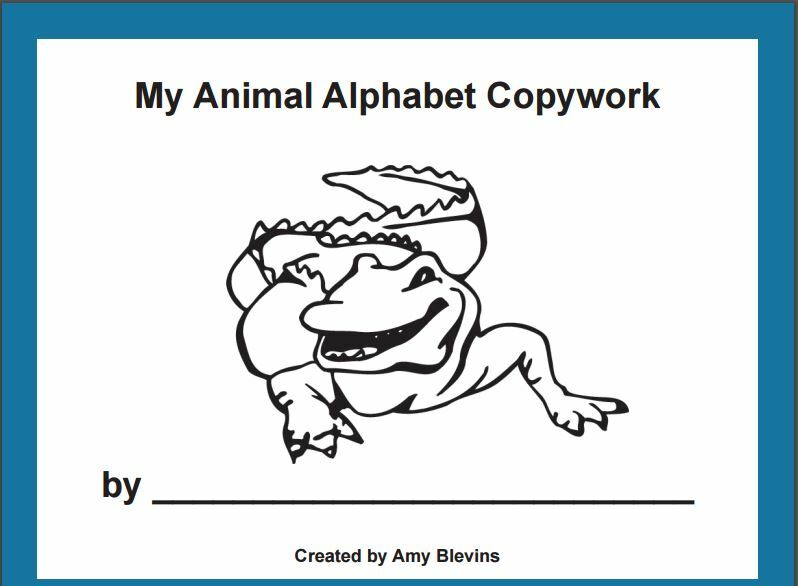 The Animal Alphabet and Transportation verbiage are links you click to download the pdf file that offers the copy work book for each item. For ease, I went ahead and saved the pdf files we were interested in to our external hard drive (file sizes range from just under 1,000 KB to well over 11,000 KB) so I wouldn’t need to get in to this site and download each time I wanted to use a sheet. There are currently approximately 35 files for early elementary, 45 files for middle elementary, 50 Junior / High School and 11 Bonus files. Keep in mind that MANY of the files cross over several of the others meaning for instance the 1 Corinthians 13 file is found in all three of the schooling areas. 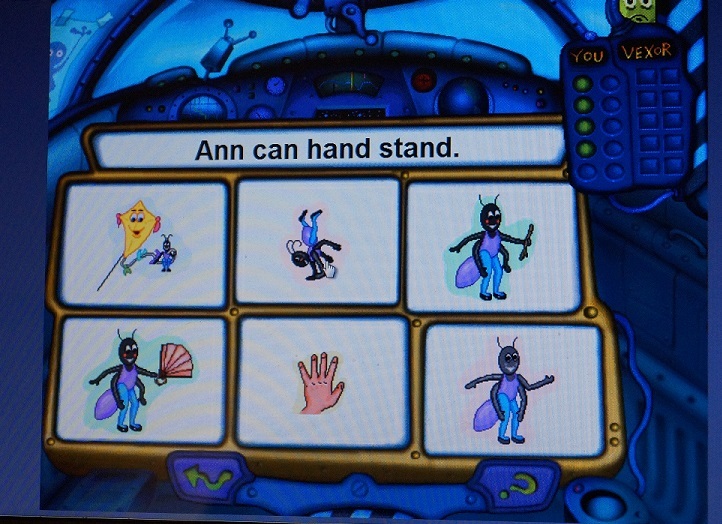 The bonus files are notebooking pages and coloring pages. HOWEVER, there are SPECIFIC copy work files that would be SPECIFICALLY helpful for different studies such as Fearfully and Wonderfully Made … which will go nicely with the Science study P is currently doing on the body. We just started that in science so we haven’t utilized the pages yet, but here is as an example of that file. Pages such as the one below have a blank page following it with lines for the student to do the copywork. 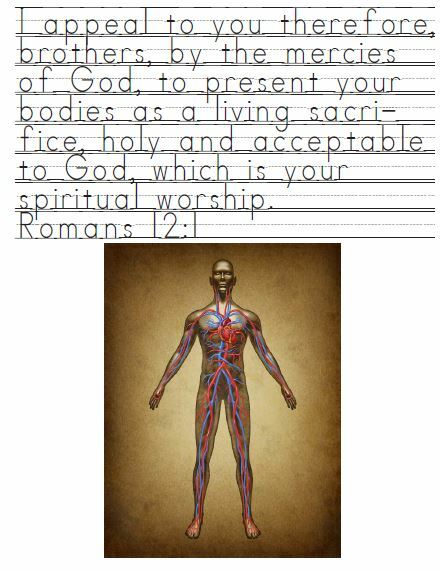 We could also tie in “The Human Body” notebooking pages from the Bonus Area for P’s science study on the body. Free Membership offers the free items available and the Charlotte Mason resources. Full Membership offers access to everything current and added for one year. Current cost is $29.95. I’m joining in the Blogging Through the Alphabet series with Through the Calm and Through the Storm as well as Adventures with Jude. I will be having animals as my theme. And sheesh – we are almost done with this round! Wolves are best known for their howl which they use to communicate in many different ways. They may be a lone wolf looking for his pack or a pack of wolves letting others know of their territory. They may also just be joining another wolf that has already started howling. Wolves vary in color from all white to all black with all colors in between. The biggest wolves live in Alaska and range from 125 – 135 pounds; the smallest is in Iran at 60 pounds. The wolf has no known natural predators and is thought to live about 10 years in the wild. Wolves are carnivorous (meaning they eat meat) and they normally hunt large animals, but they will hunt small animals if need be. They normally hunt as a pack for large animal such as moose. They develop deep bonds with their pack and have even been known to die for one of their pack members. Once they find a mate they normally stay together for life. They do have a hierarchy they establish within their pack and those at the top eat first and the others eat what is left, even if that means they have to wait to eat. Adaptable gray wolves are the most common and were once found all over the Northern Hemisphere however they are also known to attack domestic animals which has them as one of the most despised animals by humans. MANY have been shot, trapped and poisoned in order to keep them away. In the lower 48 states they were hunted to near extinction. The red wolf is found in the southeastern United States and they became extinct in the wild in 1980. Scientists have been breeding and reintroducing them in North Carolina and there are now around 100 red wolves in the wild. 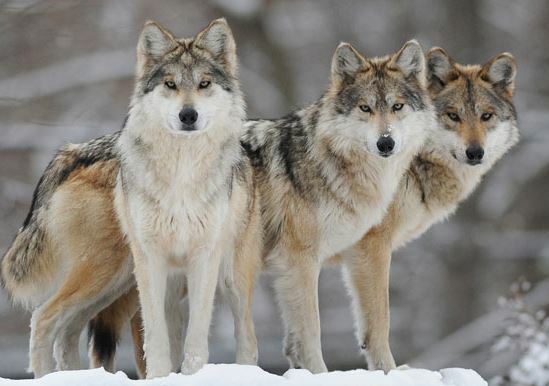 Wolves live and hunt in packs of about six to ten. I thought this was interesting, wolves can interbreed freely with dogs, red wolves, coyotes, and jackals to produce fertile offspring. This is a case of incomplete speciation. There are physical, behavioral, and ecological differences between these species, but they are fully genetically compatible. None of the animals in this group can breed with foxes, which are too far separated genetically. They have one breeding season per year and that is in the winter. That is so when the cubs are born and finally ready to hunt there will be plenty around for them. It also allows them time to grow and mature before their first winter season where it is more difficult to find food. I hope you enjoyed learning about these amazing animals as much as I did! Come back next week when we cover the letter X and learn about the Xerus. Now go check out all the other posts of those who are joining in with Blogging Through the Alphabet. They can post this entire week so make sure to check back and see what has been added! 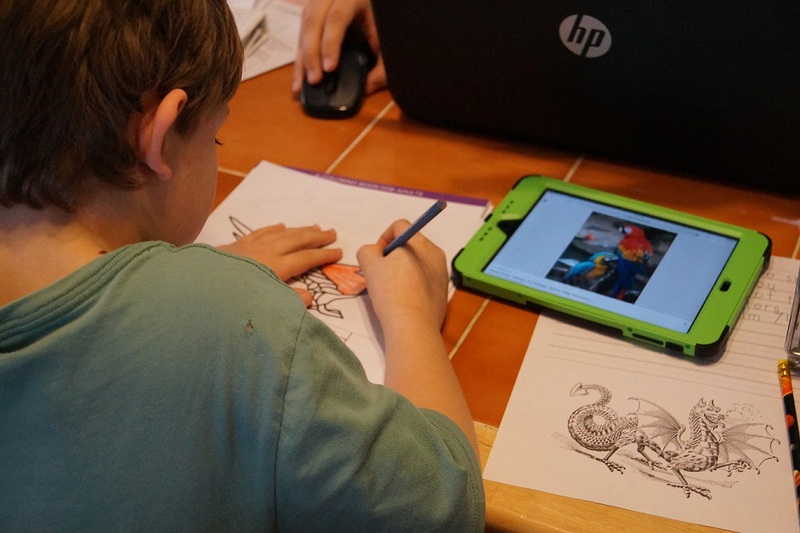 Our family was VERY EXCITED when we saw this review from HomeschoolDiploma.com and their Exclusive High School Diploma as we are graduating our first this year! Excellent timing by the Lord, as usual. 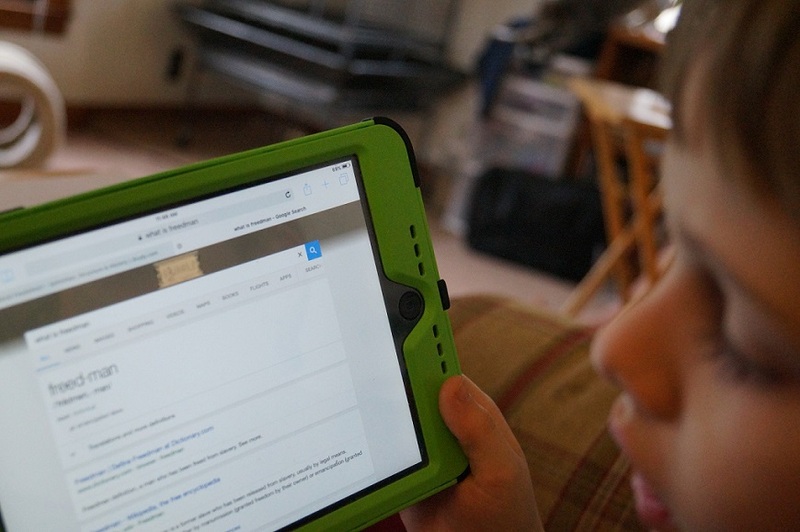 Just prior to seeing this review posted I had been searching online for diplomas so I had just a small amount of knowledge of this subject (homeschool diplomas). Once we found out for sure that we were accepted for this review, J and I hopped on to their website to check out their available diplomas. 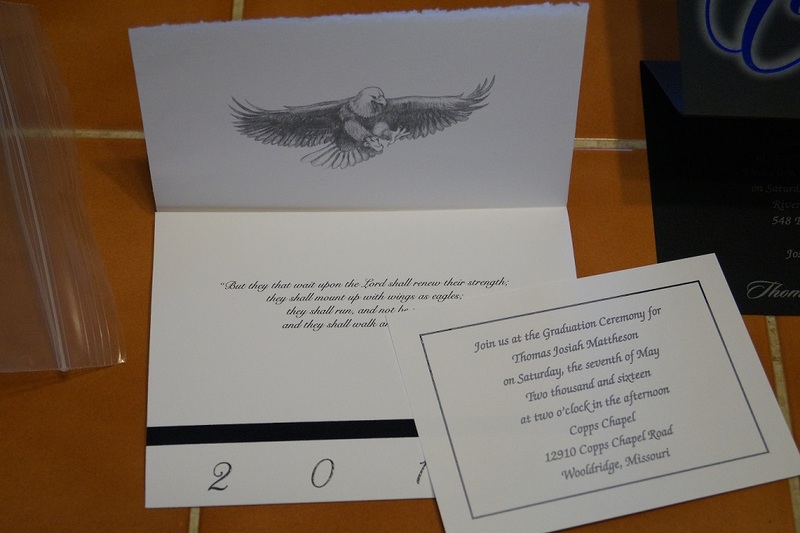 This is a very exciting time – as one graduates high school and steps out in life to be whatever the Lord may have for them – and we wanted to celebrate it in a very special way with something he will have for the rest of his life! Standard has 1 wording option with a stick-on foil seal. 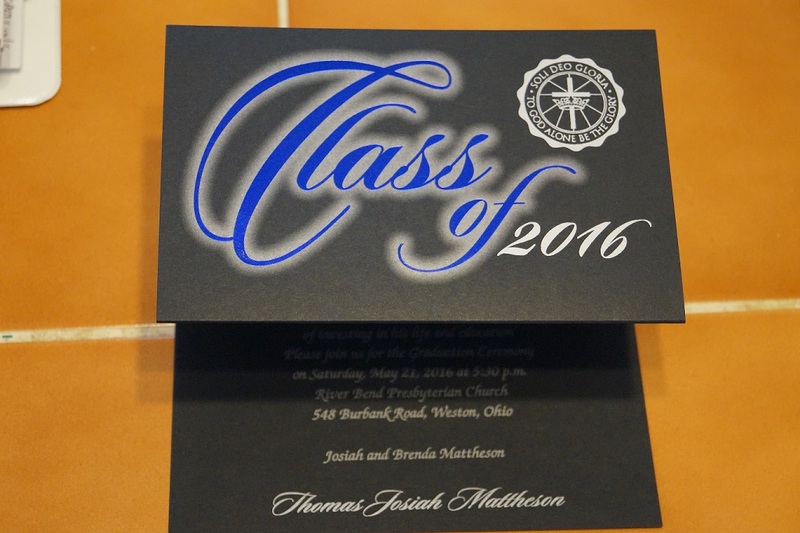 Personalized has four wording options (State Wording, College Prep Wording, “Thanks to God” wording or Godly Wisdom wording – there is a link at the end of these styles that you can click to see specifics of what this means) with a stick-on or printed seal. Exclusive has four wording options (State Wording, College Prep Wording, “Thanks to God” wording or Godly Wisdom wording – there is a link at the end of these styles that you can click to see specifics of what this means) with a foiled and engraved seal. Guilded has four wording options (State Wording, College Prep Wording, “Thanks to God” wording or Godly Wisdom wording – there is a link at the end of these styles that you can click to see specifics of what this means) with hand-illuminated 23 kt gold seal. Once you have decided which STYLE you want – you then get to CUSTOMIZE it too! This looks like a lot – and it is for offering what is needed and allows for individual preferences – but the process and the ordering is REALLY EASY! I truly appreciated the signature line suggestions they had! So, now that it is ordered. You wait. When it arrives. GORGEOUS! 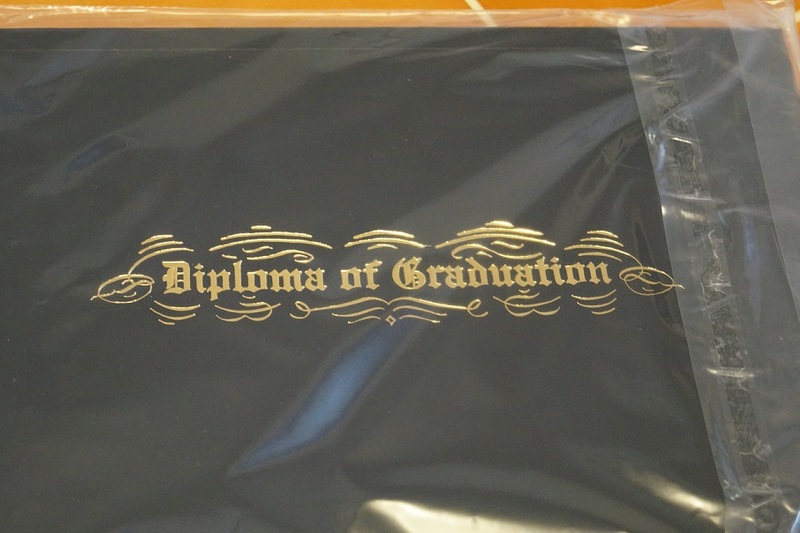 Something very simple but VERY appreciated by me was the clear plastic covering the entire diploma had when it arrived. This is something special and this just helps to keep it clean until we get to present it! 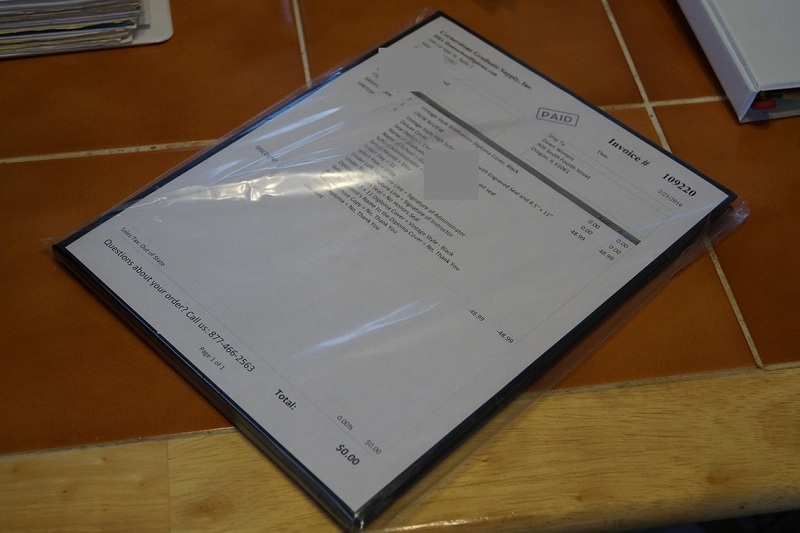 Also a copy of the invoice, of course. 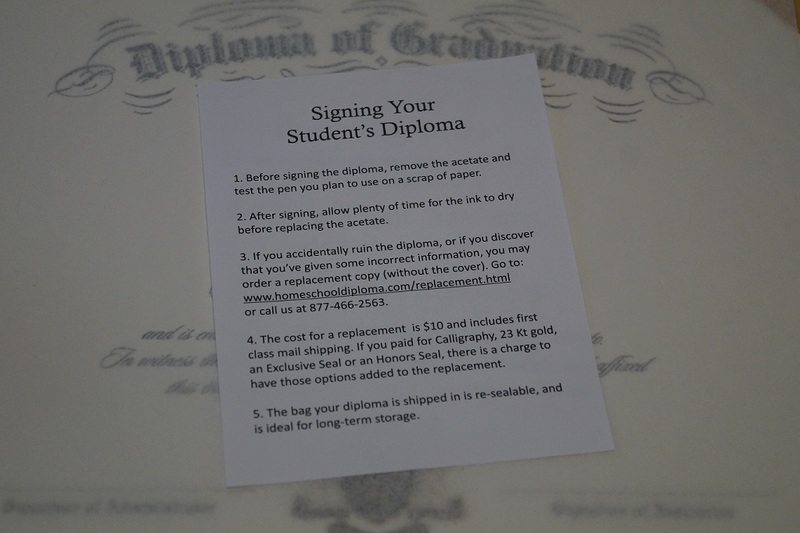 Another thing I really appreciated was this little note from them about signing the diploma. Something so simple but so very helpful for us newbies! Basically it says to wait to sign it until you give it to them. Then there is the outside, the cover … GOR-GEOUS! Then you open it and WOW! This thing is truly something to appreciate for J’s remainder of his life! 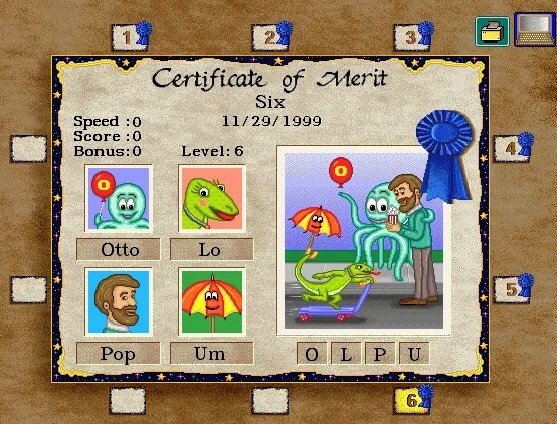 The actual certificate size is 8-1/2 x 11 and just makes us so very happy. I am SO EXCITED to have something SO GORGEOUS to give our son when he graduates! They also have caps and gowns and graduation rings. 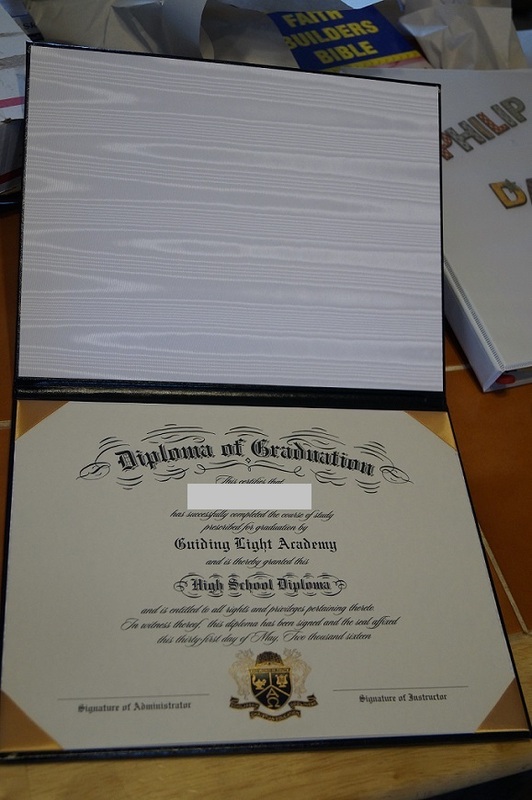 Overall, we could not be happier with the look, feel, quality, service, and ease of getting this diploma through HomeschoolDiploma.com! 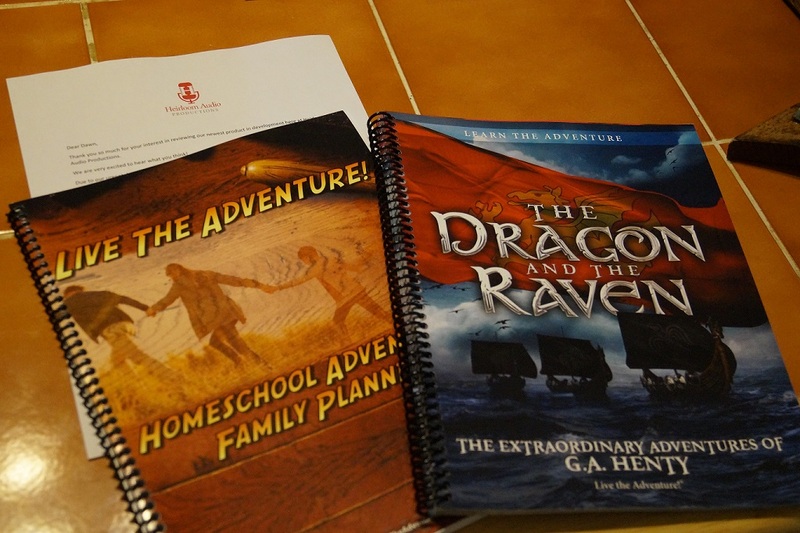 We recently reviewed Heirloom Audio‘s newest audio drama The Dragon and The Raven and LOVED it! So when Heirloom Audio asked if anyone was interested in reviewing their BRAND NEW unit study curriculum that corresponds with this audio drama – I couldn’t say “YES!” fast enough! Feudalism, Vikings, Writing, Weapons, Music, Storytelling, Latin, Poetry, Court Systems, Games, Ships, Mercy, Art, Math, and more! Whew! It is a lot, but it doesn’t FEEL like a lot (and that is a good thing, in my opinion). Each “section” has a little bit of an intro to what it is discussing. It then has different activities you can do. Some are looking up vocabulary, some are games, some are writing, some are researching … again, all areas of learning are covered! It also has activities for older or gifted students! Each section is about four pages. 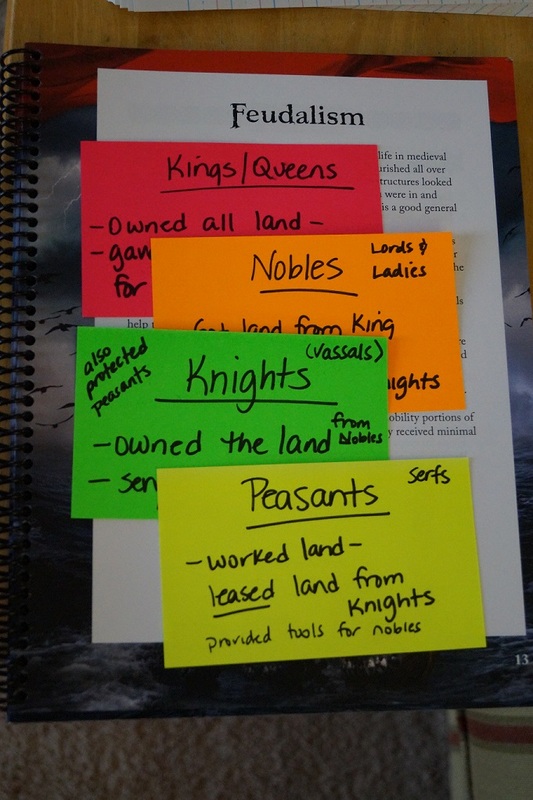 So, one of the areas we really enjoyed was learning about feudalism. For this one we decided to use our iPads to look up vocabulary online. It was a nice opportunity to use it for an educational purpose. Would “Learn the Adventure” be a helpful addition to your teaching? I would say, “YES! Oh my gosh YES! There is NO DOUBT this is a teaching help! !” If so, how? It helps guide through many different subjects within the Medieval Times. It helps focus attention on important things, events and people. 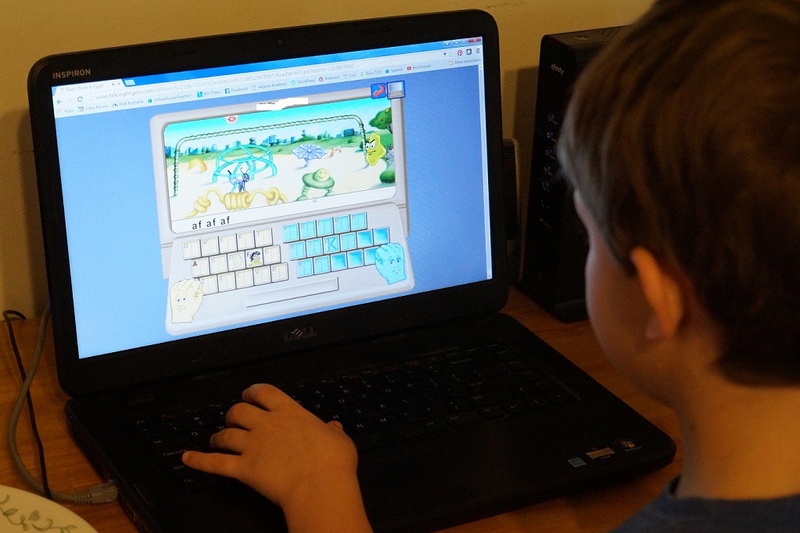 It offers suggestions of additional ways to learn as well as websites and other resources for additional learning. Now, one thing I do not know is how much this will cost … so, I cannot share anything about that. Thank you for this wonderful addition to your already amazing audio dramas Heirloom Audio, really, THANK YOU! Here’s praying you enjoy the journey of learning! Disclosure: I received a copy of this in exchange for my honest review. No compensation was received. All opinions are my own. We had the opportunity to review Times Tales DVD Digital Download from The Trigger Memory Co. If you haven’t heard of this, you will be very excited that you are reading this review! Below shows what comes with the program and what you need to use. With this you get two downloadable MP4 files as well as three pdf files. 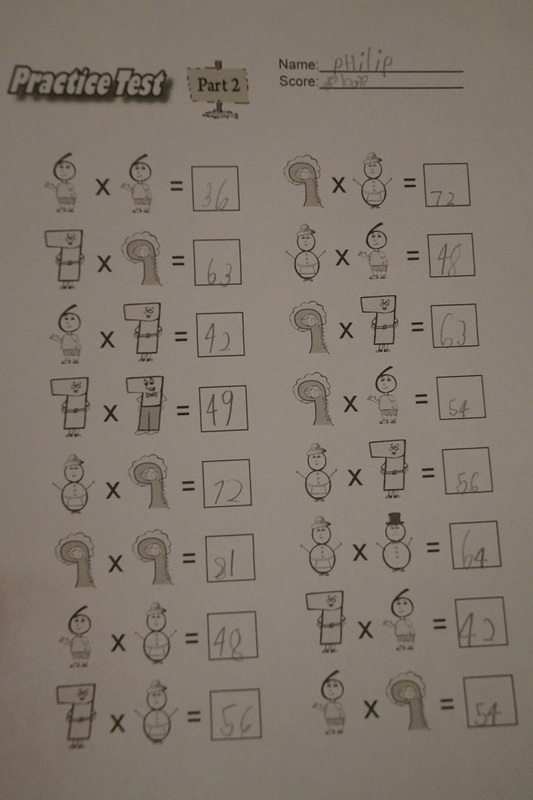 You watch the videos and use the pdf files for their worksheets (one of the three files is an answer key). This program sells for $19.95 at the time of this review. We used this with our 8 year old 2nd Grade son. So, what exactly is TIMES TALES? I’m glad you asked! 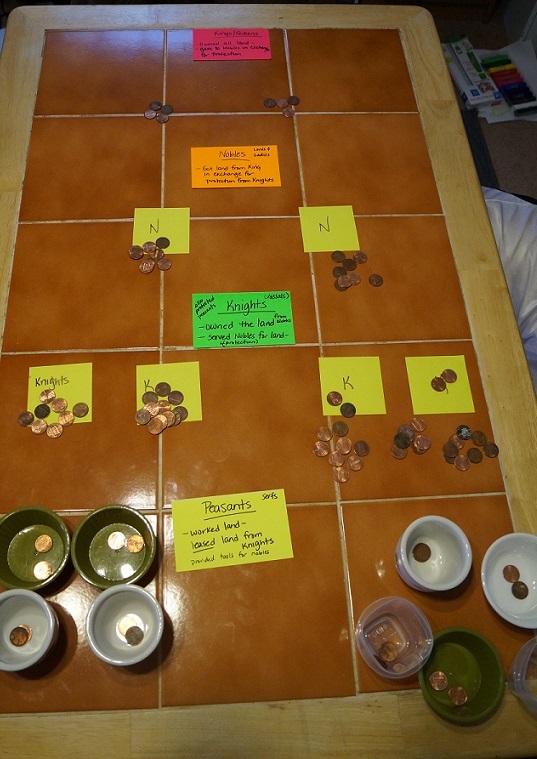 This is truly an amazing teaching tool! 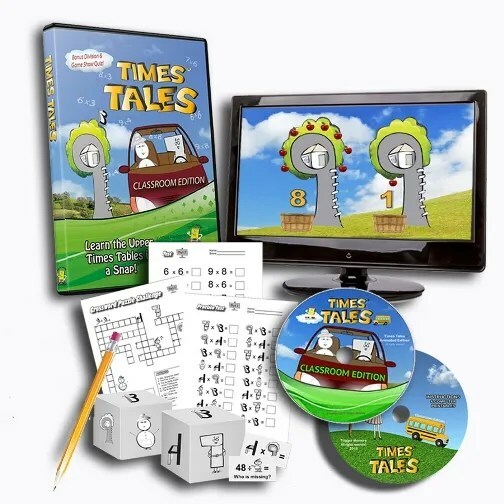 It teaches times tables to students through stories. Yes…STORIES! The students don’t even realize they are learning their times tables! GENIUS IDEA!! And…IT WORKS!!! They suggest you listen to Part 1 of the DVD first (about 30 minutes – we had to split it in to two 15-minute sessions) and then do the Part 1 worksheets for a week. Then listen / watch Part 2 (also about 30 minutes – we had to split it in to two sessions – 19 minutes and 11 minutes) and then do Part 2 worksheets. Honestly I was kind of “ho hum” about this review when we got it but boy was I WRONG! This thing is really impressive! It is quick and easy and OH.SO.EFFECTIVE! So, what do I mean by this program “teaching through stories”? Exactly that! For instance, each number has a name, seven is Mrs. Week (and Mr. Week) because there are seven days in a week, eight is Mrs. Snowman (because she looks like a snowman), three is a butterfly (because the three looks like the butterfly wings), so on etc. Then each character is shared in a story like this one: There are two trees (the trees are nines). One had eight apples and the other had one apple. So without even realizing it, they learn that 9 x 9 = 81. So fun and so easy! And as you can see below – IT WORKS! Here is a sample of one of the Part 2 Worksheets which are completed after listening to Part 2 (Part 1 are the same just the lower numbers). There are also flash cards and crossword puzzles. The numbers are shown on the different sheets as their characters and as regular numbers so you start with the character sheets and then move to just the number sheets. Such a wonderful way to work through learning higher times tables! By the end of the program they are learning division! COOL! 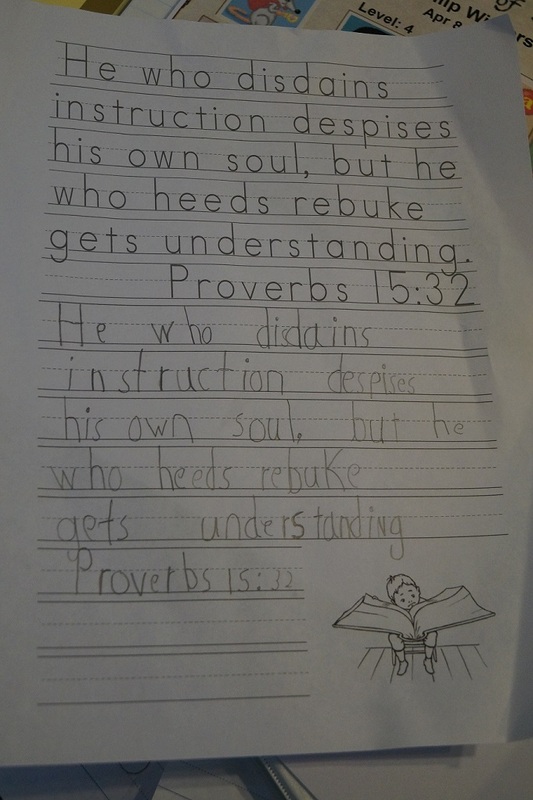 My son was actually really frustrated because as he said, “They haven’t taught us that! !” I said, “Just listen. And remember there are always the same three numbers.” So he listened, and not surprisingly, he got it right! He was really happy! By entering your email address at this link you can get a free sample download. As a side note, this program has seen GREAT response to students with special needs also!